It’s not entirely ignorant to think of British politics as nothing more than a joke at the moment. Not a funny joke, mind. Rather, a joke that is so uncomfortable, so unbelievably crass, that your body forces you to laugh out of a bizarre reflex. Just when it seems that the gap between the government and the people of the UK cannot get any wider a £1bn Conservative/DUP collation (that no one asked for) becomes a reality. The divide between the British people and their government is one of the worst in modern memory, but perhaps what is more glaring is the growing differences among the British people – specifically, the growing divide between Left and Right-wing ideologies. 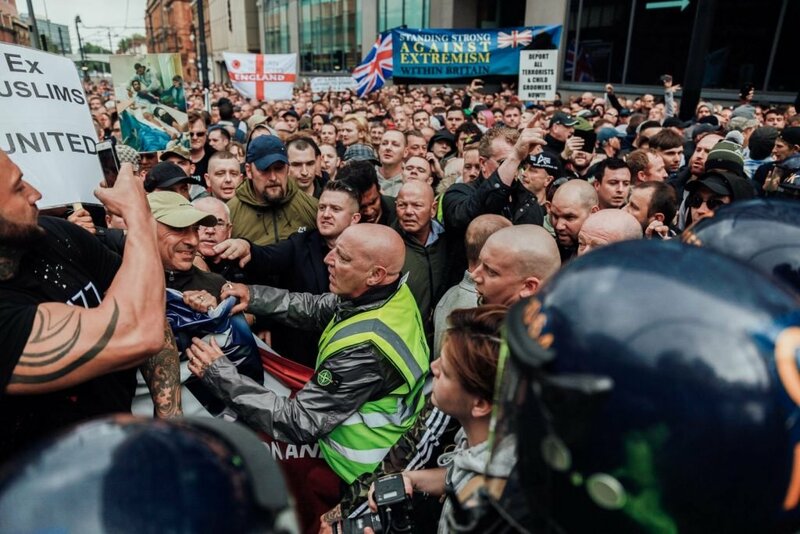 Political parties with extreme views are by no means a new phenomena – take the National Front, or BNP – but it’s hard to deny that in the last few years there has been a massive increase in extreme Right wing and nationalistic ideology in this country. While for the most part this may just present itself in archaic opinions, sometimes this translates into something much more horrific. The murder of Labour MP Jo Cox during last years EU referendum campaign and, more recently, the attack on Finsbury Park Mosque are both tragic examples of Right-wing and nationalistic views translate their extreme views into extreme violence. While there are arguably several factors for this increase in extreme Right-wing thinking in this country (the Right-wing press, Brexiteer patriotic frenzy, national security concerns) the UK is not the only country in Europe that has seen a surge. Far Right and nationalistic parties have become increasingly prevalent within the European political sphere; parties such as France’s Front National, Germany’s Alternative fur Deutschalnd and the Dutch party Partij voor de Vrijheid all make use of a similar anti-immigration and nationalistic rhetoric used by Right-wing propagators in this country. This Right wing thinking even extends past Europe. Take America for instance, with their brand new(ish) leader. President Donald Trump’s rhetoric is remarkably close to that of European Right-wing ideals; it’s all about capping immigration, scapegoating the Muslim population and putting America first. Sound familiar? One thing all these parties have in common is that they are rooted in populism, supposedly putting the concerns of their people first. Given the current economic and tense geo-political climate it’s not unfathomable as to why people may look to these voices for answers. In this country in particular, as soon as people are listening to the likes of UKIP, the EDL or hate preachers such as Tommy Robinson or Katie Hopkins is when the rhetoric becomes so dangerous. Certain corners of the British public are looking to these populist parties for answers. they want to know why they can’t get a job, why their benefits have been capped or why their children’s schools are failing and these parties use their intolerant rhetoric to answer these questions. The British people then have an outlet and target for their frustration, all while failing to realise that it is their own government causing their problems, and the media they consume is adding fire to these misconceptions. Thankfully, it is not the entire population of the UK who has embraced these ideals; while some people may just engage with politics on a more casual level there are a number of people turning to an alternative way of thinking to counter the radical right. Labour didn’t unseat the Conservative government in the most recent general election, but there’s no denying that the popularity of the party surged, especially among young people. This, however, can be seen as dividing the public further, as the two sides of the spectrum turn on each other. Anger is projected onto the new perceived enemy in a way that leaves the real perpetrators of division – preachers of hate and orchestrators of nasty politics – unscathed. Racist, xenophobic and Islamophobic rhetoric has no place in the modern world and these ideals must of course be challenged at any opportunity. 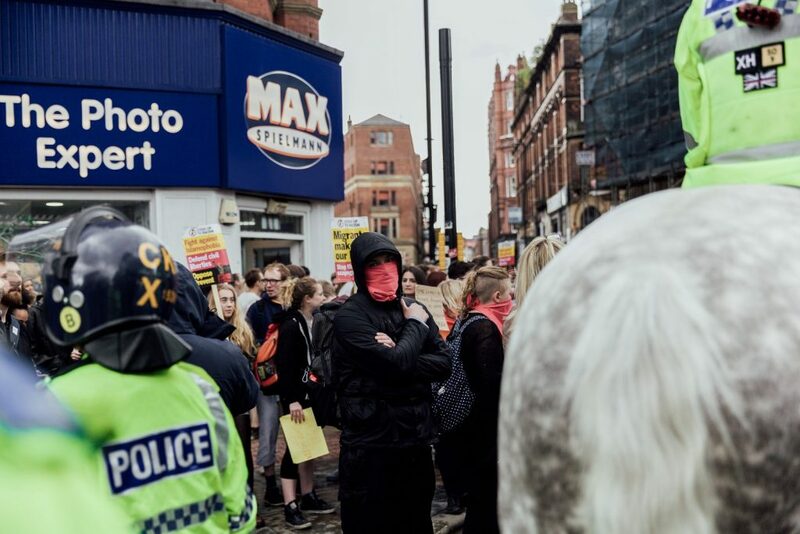 The “war” between points of view is often, in true post-digital fashion, fought through memes and insults on social media – but, it can often spill into the streets in the form of protests, most recently in Manchester. The EDL (English Defence League) aimed to “march against hate” (no, really) in the wake of the extremely tragic events that took place in the city only a few months ago, however what could have been a vigil for the victims and a march against Islamophobia sadly became a somewhat violent clash of ideologies. 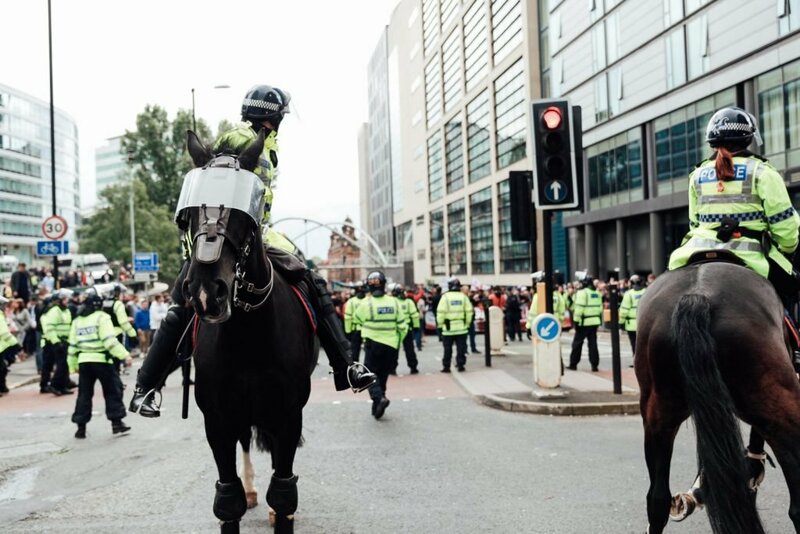 Manchester-based photographer Jake Millers, who embed himself within the EDL march and the counter-protestors in order to objectively document the events of the day, witnessed this divide first hand. Jake didn’t go to choose sides or express his own personal opinion, he went to document history and the result is a very visceral and real look into the growing discontent between the Far Right and more liberal left. Jake’s work captures the anger, the hatred and the contempt that both ends of the spectrum feel towards one another and speaks volumes more than words ever could. As previously mentioned, there are several factors that have caused this polarising difference in opinion, one of the main being the humanitarian crisis that is facing thousands of innocent people in Syria and the surrounding countries in the middle east, the escalating civil war has caused a refugee crisis that the West (and the UK in particular) have a duty to help with. However this has been labeled as a “migrant crisis” by the Right wing media, that in turn has stirred up heated debates over border control and immigration, which has fuelled the xenophobic rhetoric of Far Right parties. There is a huge difference between a refugee and someone who has chosen to immigrate to another country (neither of which are inherently a bad thing for society), however through a mixture of misinformation and propaganda they have become the same thing. The Far Right have then taken advantaged of this crisis and given their cause a faceless enemy to rally against. Speaking of misinformation, social media has been a huge factor in spreading this hatred and furthering the divide between the Left and Right, people are more able to express extreme viewpoints and surround themselves with likeminded individuals. Social media has proved to be a very influential tool during elections and has a lot of sway over the way people think, which makes the spread of misinformation all the more dangerous. While everyone is entitled to their opinions, the extreme Right-wing way of thinking must be challenged at every opportunity, as it is only through education, understanding and tolerance that we can progress as a country. We must ask ourselves who is really causing the problems in this country and unite against an austerity driven government, and hold them accountable for all the issues they have created. Those who hold beliefs in a tolerant manner should focus on uniting to challenge the extremities, rather than scoring points with each other. Only then will we see the social change that is desperately needed in our society. All photos courtesy of Jake Millers.